KSNS celebrated its 30th year in 2017. It was formed as part of the KNS in 1987 and has grown from 57 dedicated members to over 1600. The purpose of the Korean Spinal Neurosurgery Society is to improve clinical and basic research of spinal neurosurgery and to promote academic communication and social intimacy between members. As part of this mission, it publishes the Korean Journal of Spine and holds an Annual Academic Meeting and Training Seminar. 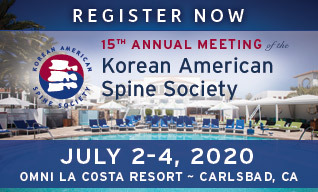 The KSSS publishes two journals in two languages, hosts two annual meetings in spring and autumn, and is the longest-running organization specializing in the spine in Korea. It endeavors to create optimal care for patients with spinal diseases through education for both professionals and patients as well as the support of research by its members in the name of advancing the academic field of spinal surgery. Founded in 1974, the Korean American Medical Association (KAMA) is a 501(c)-6 non-profit medical organization representing Korean American physicians from all generations. KAMA promotes scholarship, professional excellence and unity among its membership and chapters nation-wide.